What to read to a preschool class exploring things that float or sink? Here's what I did for storytime when they came last week. 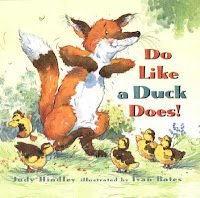 Do Like a Duck Does by Judy Hindley - Large, colorful illustrations make this fun for sharing with a group, but be sure to read it a couple times first because the rhymes don't always rhyme exactly and the rhythm gets wonky in some spots. Still, there's a perfect spread for Float or Sink - when the ducks plunge into the water and the faux duck (read: fox) sinks like a stone! Five Little Ducks Went Out One Day - Song with duck stick puppets that we fashioned from construction paper and craft sticks. As you sing each verse, move your hands (holding the ducks) behind your back and leave one on the chair behind you. I always finish by having the kids quack louder and louder and then finally bringing back all five ducks. 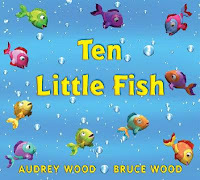 Ten Little Fish by Audrey Wood - Okay, fish don't really sink or float, I guess, but I love this one and it was perfect for the three-year-olds I was reading to. The bright, computer-generated illustrations really capture their attention. This one has great rhymes and I love that the last little fish doesn't end up all alone - soon another comes along and they start a fishy family. If you have a red sailboat, put it in the water! As I said the different colors, the kids who had that color sailboat would come up and put their boat on the felt board (luckily, our felt board is blue so I told them to pretend it was water!). And see how simple these felt pieces are? I'll let you in on a librarian secret - felt pieces do not have to be elaborate or even beautiful to work for your storytime. Passing out felt pieces and allowing kids to come up to the board gives them something to do and engages them in your storytime. After each color, we counted how many of that color we had. After every child had put their boat in the water, we counted them all together (another librarian secret - this is an easy way to keep track of how many kids are in your storytime!). 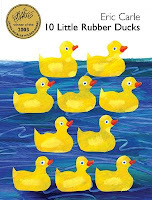 10 Little Rubber Ducks by Eric Carle - This is a great book for floating. Based on a true story, ten rubber ducks are tossed out of a boat during a storm and as they float on and on each one meets a different creature. The text is a little wordy for sharing with young preschoolers, so I paraphrased and that worked quite well.This is a great book for vocabulary - the ducks meet a dolphin, flamingo, seagull, and many other marine animals. 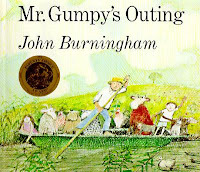 Mr. Gumpy's Outing by John Burningham - When Mr. Gumpy takes his boat out, everyone seems to want a ride! But when they misbehave, the boat tips over, spilling everyone overboard. I like to tell this one with puppets, using a basket for the boat and then dumping out puppets all over the floor when the boat tips. I admit that this storytime is heavy on the "float" and light on the "sink". Combine some of these books with a sink or float demonstration if you're not afraid to get a little wet. I read Do Like a Duck Does to a first grade class yesterday... first time I've looked at the book and it is a little hard to read out aloud. I had read Don't wake up the Bear before I read this one and it doesn't rhume but has pacing...repeating words. I love the picture where the mother duck asks the fox are you sure you're a duck... the artist caught a mama's expression when she's not sure and her babies might be in danger. Oooh great storytime theme-ing! Will definitely use your good ideas. Thanks for sharing! Love the boats and calling out the colors in a song. What a great way to incorporate so many different learning styles in a single program. Another fun sinking book Who sank the Boat by Pamela Allen. Can be made into a felt board too. Hmmm, I'm wondering if there would be some way of doing this with plastic models and a tub of water so you could really sink it...without making a huge mess of course! I'm a preschool science teacher and I love to incorporate good books into my lessons. These suggestions will help a lot!! Thanks!